If Louisville, Kentucky could have one major claim to fame in the world, it would be the Lousiville Slugger. At least in my mind. After all, the wooden bats made here have become synonymous with baseball. The “Lousiville Slugger” scroll etched onto each bat is easily recognized. In downtown Louisville, it is easy to see the city’s deep appreciation for the bat manufacturer. For more than 120 years, the maker has been here, creating bats for some of the world’s best baseball players. In the century-plus, Louisville Slugger has sole more than 100 million bats and is considered the most popular bat brand in the history of the sport. Today, the company has extended its breadth, now making gloves, helmets, gear, bags and more. 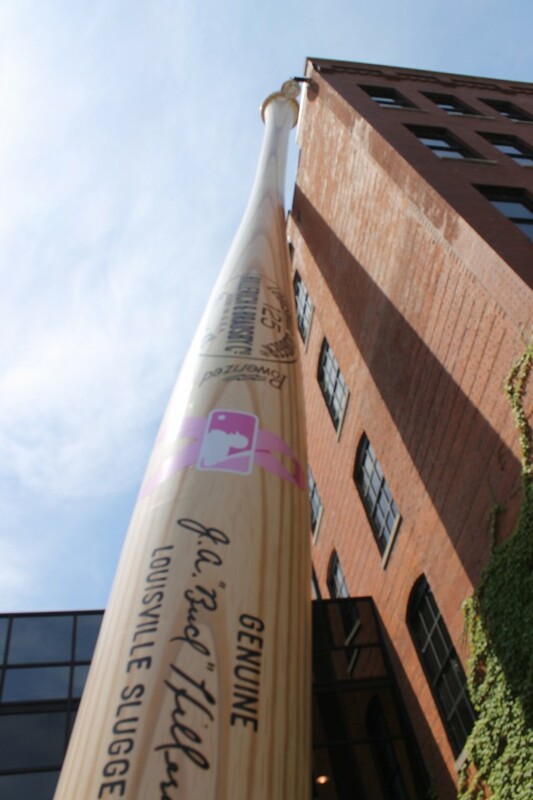 During our road trip, we made a stop at the famed World’s Largest Bat, perched against the Louisville Slugger Museum. Made in 1995, the five-story bat weighs in at 34 tons and is made of hollow carbon steel, like the bat used by Babe Ruth. I’m a big baseball fan, so I would definitely stop by! I used one of these bats as a kid! Well, not one quite so big as this, but we can’t all be Babe Ruth. Ha ha. We can’t all be Babe Ruth!